For even the most botanically inept, terrariums are super easy to make and incredibly low-maintenance. They also make pretty much the best gifts or party favors ever. Step 1. Choose an open or closed glass container of some sort. Step 2. Cover the bottom with an inch-thick layer of pebbles or rocks to create a false drainage system for the plant roots. Step 3. Add a thin layer of activated charcoal keeps the water fresh, and prevent mold and bacteria from building up. Step 4. Add a layer of potting soil. They also make a special mix if you choose to use cacti and succulents instead of moss and ferns. Step 5. Place plants in the terrarium, starting with the largest plant first. For more details, check out this terrarium guide here. You'll need tweezers for this one. Full tutorial here. Use 5-watt bulbs so you don't end up roasting the plants. This one is from Score and Solder. Click here for the full tutorial (in Swedish). And if you're too lazy to get the supplies yourself, there are tons of terrarium kits that contain everything you need available from Etsy. 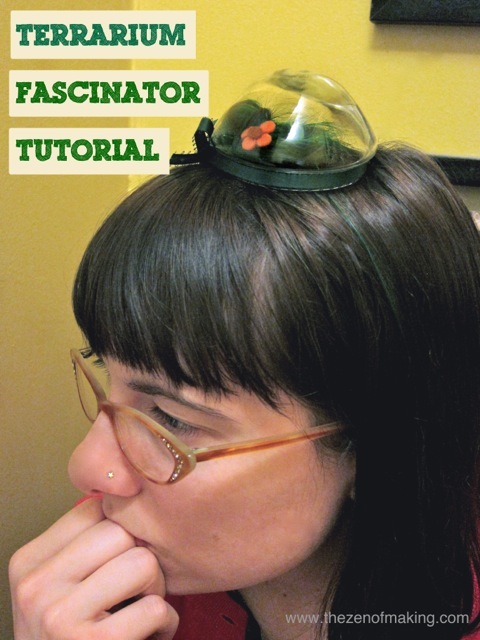 And...if you're feeling quirky, you could wear one on your head.